[p.338] ...The United States Patent Office has recently stated that while the Index of Patents says that on February 9, 1811, a patent was issued to Robert Fulton, the office is unable to furnish a copy of it, as the records of this and other early patents were destroyed in the Patent [p.339] Office fire of 1836. It is well established, however, that Fulton's first United States patent was obtained February 11, 1809, and a supplementary patent February 9, 1811. “First: The mode of communicating the power from the piston rod of the engine to the water wheels without the common beam and in such a manner as not to strain or impair the boat. Second: I am the first who discovered the superiority of water wheels over other modes for gaining a purchase on the water, and I am the first who applied water wheels to a steam boat. They are described in the specification, one on each side of the boat and their number of arms, diameter, and size of propelling boards minutely detailed. Third: The wheel guards around them are also detailed. Fourth: I have shown that steamboats must be built four or more times the length of [p.340] breadth of beam; all sloops and river craft are three times the length of their breadth of beam. Fifth: The bow and stern should be sharp to angles of at least 60 degrees. The bow should not be full like sloops, for two reasons; that being long they cannot rise on the waves like sloops but must cut through them, and being sharp the resistance is less. Seventh: A table of the resistance of the water and how to calculate the total resistance of the boat while running from one to six miles an hour, unless this be first ascertained it would be impossible to tell what strength of steam engine would be required. Eighth: The specifications show the power necessary to drive the boat and the power consumed by taking the purchase on the water and thus arriving at the whole power required the power of the steam engine may be calculated. Ninth: Shows the size of the cylinder, the piston running two feet a second. [p.341] Tenth: Shows the diameter and velocity of the water-wheels. Eleventh: Shows the size of the propelling boards. Twelfth: I am the first who combined sails with steam to drive a boat. Thirteenth: Shows the steering wheel and pilot near the middle of the boat and over the station of the engineer. Science Quotes by Robert Fulton. 14 Nov - short biography, births, deaths and events on date of Fulton's birth. Robert Fulton - The First Steamboat from Cradle Days of New York (1909). Inventor - Businessman - transcript of a 1940s radio talk by Charles F. Kettering. 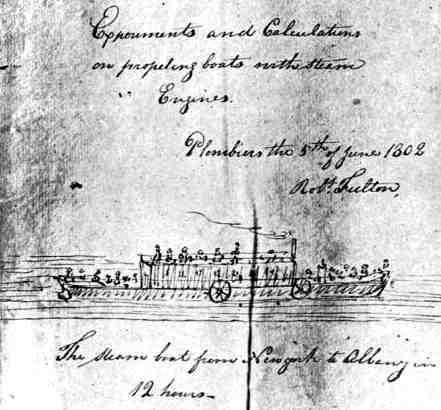 11 Feb - event description for steamboat patent issued to Robert Fulton in 1810.